Addressed as the capital city of Sri Lanka, Colombo is known best as the bustle and sizzle of Sri Lanka. The unmatched evolution of the city has proven to be the stardom of the Island. Apart from being identified as the corporate city, Colombo also ranks highest in terms of its entertainment and attractions backed up with a long history throughout. The abundant multicultural society throughout the city enlightens the stability of cultures within one nation. Visit the 130 year old golf club designed by the British and was originally owned by Sir Charles Henry De Soyza. The 18 holed golf course consist of 6560 yards black tees, 6303 yards white tees and 5186 yards Ladies tees. The fairways are designed with buffalo grass while Grass is with Tifeagle. Practice facilities include 20 Bay covered driving range with practice putting and pitching greens. The museum was established in 1877 by the British Governor at that time, Sir William Henry Gregory is an Italian architecture. Having met international standards, the museum earned the status of national museum. The museum consist of facilities as E cards, museum shops, museum tours, auditorium booking, mobile bus and mobile exhibitions. Visit the national zoological garden just 11 km away from the city of Colombo. The 30 acres which is beautifully landscaped comprise of an aquarium, aviary, Butterfly Park and a reptilian.Daily Elephant performances have been top rated throughout. Visitors enjoy the opportunity to witness various rare species as Arapaima who is considered as the largest fish in the world. Some other rare species include Lung fish, Polypterus, Sea Lions and many more. Galle face green which was designed and developed by the governor in 1859 is a lovely place to relax facing the Indian Ocean. The land stretches beautifully over half a kilometer alongside of the sea. The breathtaking greens is not just a romantic place to be when the sun disappears, but also an amazing park to enjoy with family. Flying kites is often seen during weekends. It an amazing place to walk around the sunset or even spend overnight on a weekend with friends and family. The Temple stands in pride on the Beira Lake as one of the most important temples in the city of Colombo. The temple resembles a great friendship between the nations of Sri Lanka and Thailand which lead to a mix architectural designs in the temple with stone carvings and Buddhist arts. Exceeding 120 years of existence, the temple serves as an assembly hall for monks and acts as a vocational training center. The archelogy is unbelievable and soothing that one would feel to spend an entire day. No journey would feel completed without embracing the relaxation of a SPA. As the central city, Colombo offers its guests with many SPA and wellness centers to feel relaxed and reborn. Let the Island’s best masseurs treat you with Ayurvedic massages from head to toe with every bit of refreshing and rejuvenating therapies utilizing original herbal ingredients in a quiet environment letting you feel and hear the in depth mind and body relaxation. Colombo is a city where no one gets bored as there is something for everyone. With the increase in demand, the city of Colombo developed varieties of nightlife entertainment. Anyone who would like to socialize a bit extra as well as relax and enjoy in weekends have the opportunity to visit many places. With the arrival of the pub culture, clubs and discos, people tend to entertain more and more. 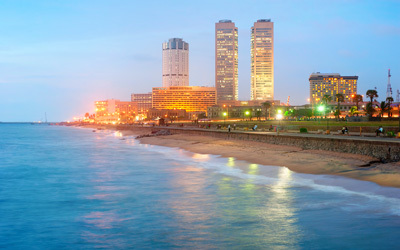 Thus, Colombo offers all its visitors with international Dj’s, live bands, theme nights and many more. Colombo greets welcome to all the shopaholics around the world as it offers international brands catering various demands. Some of the best shopping complexes include, Majestic city, Crescat Boulevard, Liberty plaza and many more of branded clothing and accessories. One wouldn’t leave heartbroken as endless shopping in Colombo would fill your heart with contentment and treat you Royal throughout. City of Colombo has access to basically all modernized and convenient services to all its guests. International banks, standardized hospitals, money exchanging facilities, less to high expensive shopping malls and many more. During your vacation to Sri Lanka, city tour in Colombo is an experience one wouldn’t miss for the goodness packaged in it.